The bridal headpieces and accessories you choose to wear as you walk down the aisle are as much a style statement as your wedding dress. 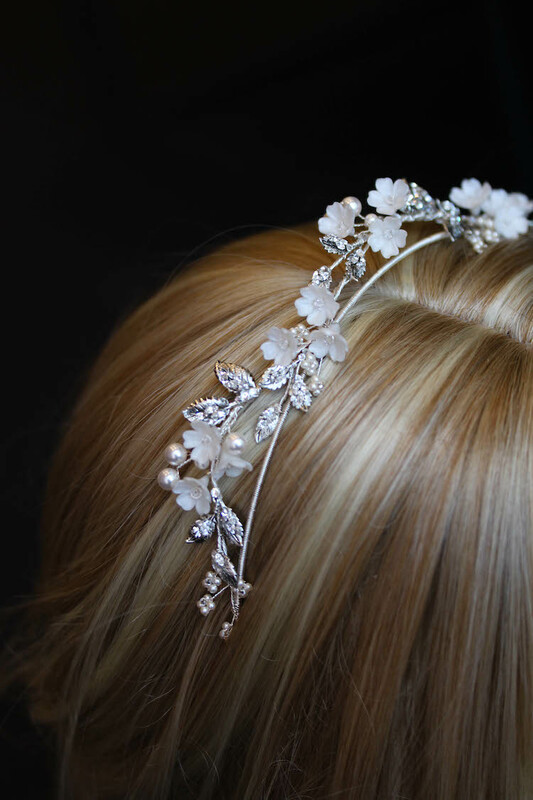 It’s important to also consider that it’s not just the headpiece or accessory itself, it’s also the way it’s styled and where it’s positioned which can make your bridal look. It can feel overwhelming when you get engaged and you suddenly need to make a whole series of decisions. Some decisions are definitely bigger than others (the dress, the venue, the bridal party!) but sometimes it’s the little things that can get in the way of making a decision so you can tick it off the list of things to do. When it comes to wedding accessories, there’s a long list of lingo that can sometimes go straight over your head. After all, you may never have needed to know the difference between Guipure lace and Chantilly before you found your wedding dress, and you might be wondering, what’s the difference between a snood and a Juliet cap? Here’s my A-Z of bridal accessories and some of the more common terms you may come across in your travels. I’m a bit of a visual person so I’ve included photo examples too to help you out! Alencon Lace (pronounced uh-lon-sahn): A fine French lace, often features a distinctive floral and leaf pattern on a sheer net backing. Sometimes referred to as corded lace as the distinctive patterns are often outlined with a corded raised edge. Traditional French alencon lace features a fringed or ‘eyelash’ edge, as shown below. Note: French corded alencon lace on the left, French Chantilly lace (non-corded) on the right. Applique (pronounced ap-pli-kay): Details which are either re-embroidered or sewn into fabric with a corded edge. Leftover appliques from your bridal dress fittings can be cut into motifs and used to create your bridal accessories. Cut outs examples can be seen below. Beading: Fine details featuring seed beads, pearls, crystals, sequins and rhinestones which are stitched directly onto the fabric or lace. Pretty effects can be achieved with mixing hues within a similar colour palette, textures and contrasting details. Birdcage veiling (French vs Russian): French netting is a high quality silk net that’s softer and delicate to touch and features smaller diamond shaped patterns. It is no longer produced today and is only available in its original vintage condition. Russian netting is its modern day equivalent. It’s made from 100% nylon, is slighter crisper to touch and is readily available in a wide range of colours and widths. Bobby pins: Sometimes called a hair pin. In the context of hairstyling, bobby pins are used by a hairstylist to secure your bridal hairstyle. Decorative hair pins or combs can then be used to adorn your finished look once all your bobby pins are in place. Bridal comb: A hair piece designed to be secured to the hair with a comb. Attaches to the hair by inserting the comb’s teeth into a portion of hair and then secured with bobby pins from underneath. A broad term which covers a range of different hair pieces in varying sizes, styles and shapes. Can be worn in varying positions, depending on your hair length and style. Most wedding veils are attached to a bridal comb. If you would prefer a clip, a comb can often be substituted for a small discreet hair clip. All Percy Handmade pieces are handcrafted with metal hair combs attached rather than plastic combs which are less durable and more difficult to secure. Bun wraps: A hair piece designed to be worn specifically around a bridal bun or updo. A versatile piece which can also be positioned in other bridal hairstyles including half up/half down hairstyles or alongside a messy updo. Chantilly lace: A delicate French lace featuring delicate floral designs on a fine net backing. A beautiful lace to trim wedding veils for a soft and delicate finish. Crown: A full circular piece that sits on top of the head. Different to a tiara which is often a semi-circle in shape. This term refers to the shape and style but the details can include fresh flowers, stones, pearls or fine beads and crystals. Embroidered lace fabric: A lace fabric where the floral patterns are machine embroidered onto a fine netting as seen in the French embroidered lace below. Re-embroidered lace is where an additional detail is applied on top of an embroidered lace, often in the form of a distinctive pattern defined by a corded edge or similar. Fascinator: A larger, statement headpiece, that’s designed to be worn at the side of the head. Usually features dramatic structured detailing such as features, silk flowers, sinamay and horse hair accents. Sometimes features a birdcage veil. Garter: A narrow fabric band designed to be worn around the thigh of a bride. Can be made from elastic, tulle, fine laces or silk fabrics and finished with rhinestones, pearls or soft double sided satin ribbons. Guipure lace (pronounced gip-pure): A heavy lace with open background, featuring lace motifs that are held together by large connecting stitches. Sometimes known as Venise lace in the United States. Hair pins: A term sometimes used to refer to a bobby pins. In the context of bridal accessories, a hair pin is a V or U shaped pin that features a decorative detail that be easily slid into a French twist or bridal up style or half up/half down hairstyle. Hair vine: As the name suggests, a term used to describe an ornamental detail which runs along the side or around of a bridal hairstyle. Often attached to small hair combs, or if not, can be held in place by with discreet bobby pins. Half crown: Larger than a tiara but smaller than a crown. The half-crown is sometimes referred to as a semi-crown and sits atop the head as a statement headpiece. Headband: A band of varying widths, sizes and details. Designed to be worn along the hairline or slightly further back to frame the face. Can be made on a metal or plastic base for a solid look, or fixed to a soft ribbon and tied at the nape of the neck. Juliet cap: A fitted cap that fits comfortably on top of the head. Often crafted from soft laces and/or netting, and usually finished with fine beading or pearls. A fine wedding veil can be attached to the back or side of a Juliet cap to complete the look. Netting: A fine soft netting often used in wedding veils and dresses. Can include English net, Point D’Sprit or similar netting with a slight stretch. Pearls: A smooth, rounded bead with a lustrous finish. Naturally created in the shells of certain mollusks in a range of colours, typically whites/cream, pinks and greys. Natural pearls include cultured freshwater pearls, South Sea or Tahitian pearls. Man-made pearls can include synthetic glass or plastic ‘pearls’ or crystal pearls such as Swarovski pearls. Swarovski pearls feature a crystal core and are designed to be consistent in weight, colour and lustre to natural pearls. Rhinestones: An artificial gem made from a crystal with facets that are designed to imitate a diamond. Sometimes referred to as a diamante in Australia and the UK, and often set in a pronged setting with a silver foil lining to sparkle and shine. Available in a range of sizes and shapes including marquise, round, baguette, emerald cut and square. Seed beads: Teeny tiny beads that resemble small seeds used for decorative purposes. High quality seed beads feature consistent hole sizes, shapes and even colourings. Can be made in glass or high quality plastics from the Czech Republic or Japan. Often available with a matte, translucent, opaque, metallic or aurora borealis finish (aka AB or rainbow effect). Sequins: Small round or slightly squared disc shaped beads commonly used for decorative purposes to adorn fine formal fabrics and laces. Some sequin discs are flat and others are faceted or raised to increase their reflective abilities. Silk: A luxurious natural fibre made from the cocoon of silkworms. It’s strong, available in a range of textures and weights (dupion, taffeta, organza, chiffon, crepe just to name a few) and takes well to natural colour dyes. Silk Flowers: Flowers and floral decorations handcrafted from silk fabric which have been treated, stiffened, cut and formed using heated millinery tools. All Percy Handmade silk flowers are handcrafted and hand-dyed from scratch using traditional French millinery flower making techniques. Snood: An open work net that encloses the hair at the back of the head, similar in style to 2012’s Chanel take on the 1940’s hair net below. Tiara: A semi-circle shaped headpiece worn on top of the head. Associated with royalty, tiaras are often jeweled or feature intricate beading and details. Trims: In the context of wedding veils, trims are the finishing touches to the edge of veil. These can include fine beading, ribbon edging, rolled edges or lace trims as shown below. A veil without a trimmed edge is often referred to as a raw edge veil which offers a clean and unobtrusive finish. Tulle: A fine netting commonly used in wedding veils. Available in a range of weights, colours and textures. Most wedding veils are made from bridal illusion tulle which is soft and crisp to touch (unlike the tulle used to create ballerina skirts which is heavier and coarse to touch). Wreath: Also known as a garland, a wreath features a circle of natural or silk flowers, twigs, foliage and ribbon, and can be designed to rest on the crown of the head. I really hope this list was really helpful to you! And, if I missed anything, please feel free to let me know by leaving a comment below and I would be more than happy to add it to the list for you with an accompanying image.